Arthur St. Clair was born in Thurso, Scotland, in 1738. He served in the British Army before emigrating to America in 1762. 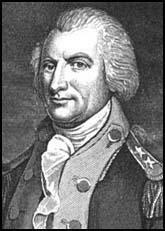 St. Clair settled in Pennsylvania and during the American Revolution served as a brigadier general in the Continental Army. He took part in the battles at Trenton and Princeton but was criticised for his decision withdraw from Fort Ticonderoga in 1777. St. Clair was one of Pennsylvania's delegates to the Confederation Congress (1785-87) and was the first governor of the North-West Territory (1787-1802). St. Clair established Losantiville (Cincinnati) in 1788 and was commander of the army defeated by Little Turtle and the Miami Indians in 1791. Arthur St. Clair died in 1818.